Hello my readers! 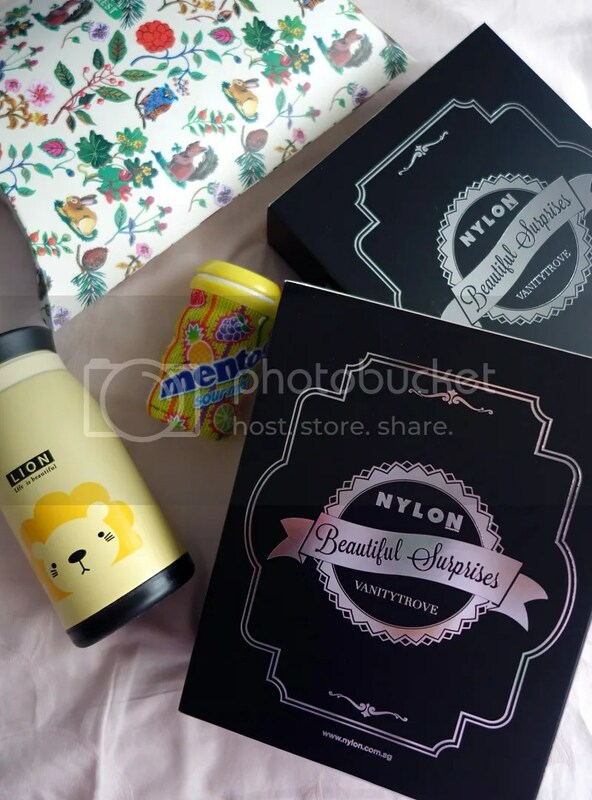 Vanity Trove has recently collaborated with Nylon Singapore once again to launch a series of Vanity Trove x Nylon Exclusive Trove filled with many beauty favorites. 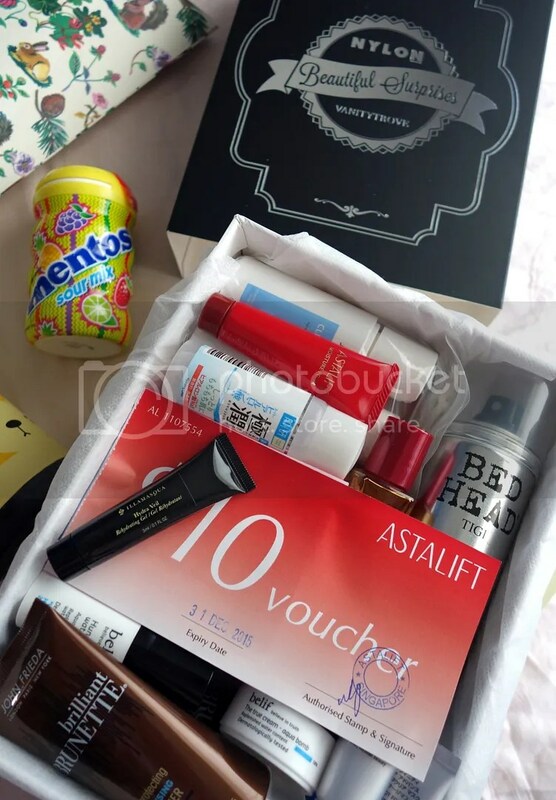 This collaboration has brought about a series of monthly boxes which consists of a wide range of products including makeup, haircare and skincare products from highly raved brands. The Vanity Trove x Nylon Exclusive Trove concept has been introduced and launched in 2013 with much success so now it has been reintroduced. 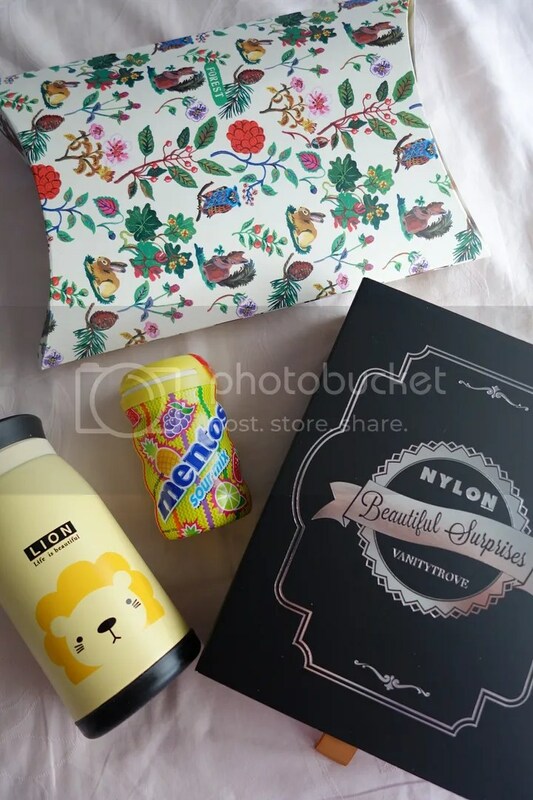 Nylon Singapore is the reigning authority on fashion, beauty and music for the modern and intelligent young woman. The value of the full size items in July’s Trove adds up to about $38 plus you are also getting some deluxe size samples. It is really worth it IMO and now we shall take a look at what’s inside! 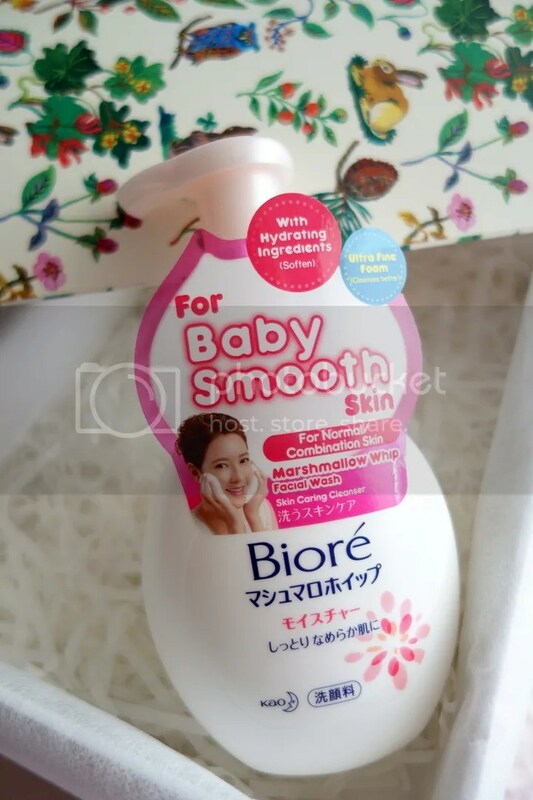 First item that i wish to feature is the Biore Marshmallow Whip Facial Wash which i have been wanting to try after hearing Chantana’s feedback on them. Biore Marshmallow Whip Facial Wash is made for people with normal to combination skin and it will foam instantly with just 1 pump! With an improved formula, it has Skin Purifying Technology that rebalances & improves the skin. It also contains hydrating ingredients that softens skin. With 800% more micro-bubbles and 8x denser foam, Biore Marshmallow Whip Facial Wash can penetrate into pores to remove all dirt, oil and impurities effectively. Tried this foamy facial wash for a few times and i find that it has a nice dense and fluffy foam which turns into a thick creamy after lathering. Really love the texture as i prefer using a facial cleanser which has a thick lather~ 2 full pump is sufficient to cleanse my face effectively and the facial foam has a light flowery scent . I also feel that this foam is suitable for those with sensitive skin as it is gentle on skin (doesn’t sting), hydrating and doesn’t dries up the skin after cleansing (No skin tightness). If you are looking for an affordable facial foam ($13.90 for 150ml) for sensitive combined skin, you can give it a try. 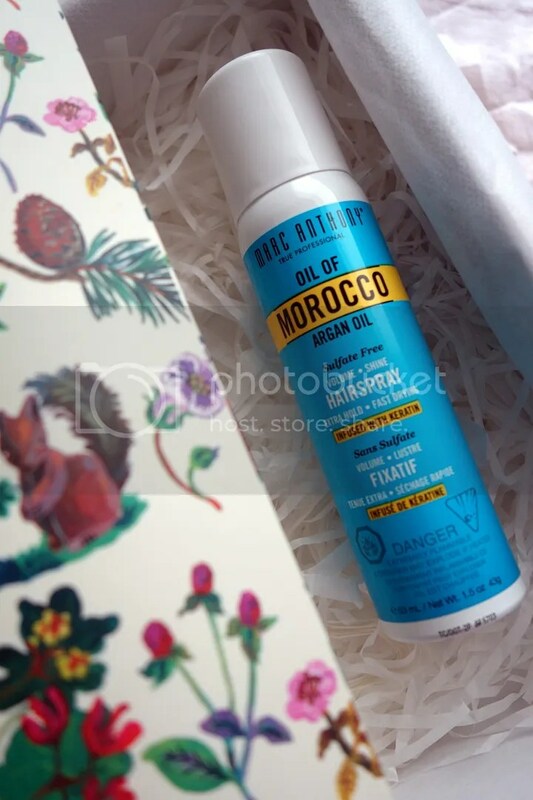 Next, for ladies with flyaway hair issue (like me), the Marc Anthony Oil of Morocco Argan Oil Hairspray will work in controlling it plus deep nourishment, strengthening and conditioning as you style. Infused with Argan Oil, Keratin and Grape Seed Oil, get extra volume, shine and hold with this dual purpose hairspray; nourishing and styling in one! The non-water based, fast drying formula creates volume and hold without stickiness or flaking and its flexible finish creates workable styles for easy re-styling without crunch or heavy build-up. 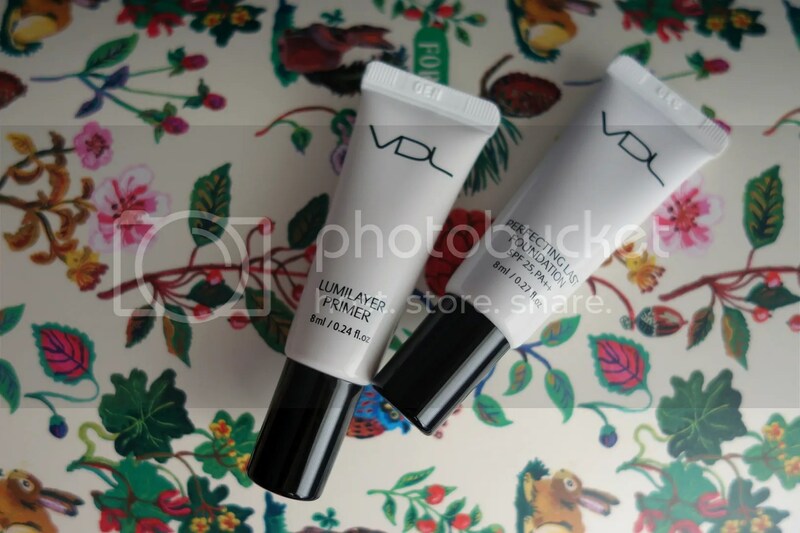 It creates a luminous finish and shields against humidity for longer lasting styles. Sun Protectors keep the sun and other elements from damaging your full-bodied mane. When you buy Argan Oil products for your hair you’re getting one of the best natural resources for healthy looking hair. What more could you want from a hairspray! Will recommend that you use this spray before you blow dry your hair. With just a few sprays, it will tame your hair and reduce the amount of flyaway hair. Moreover, it adds shine and volume without any weighed down feeling. Although it don’t smell pleasant to me, i can live with that and i’m surprised that it holds up remarkably well despite the heat & humidity! This is certainty one handy hairspray filled with so much goodness. 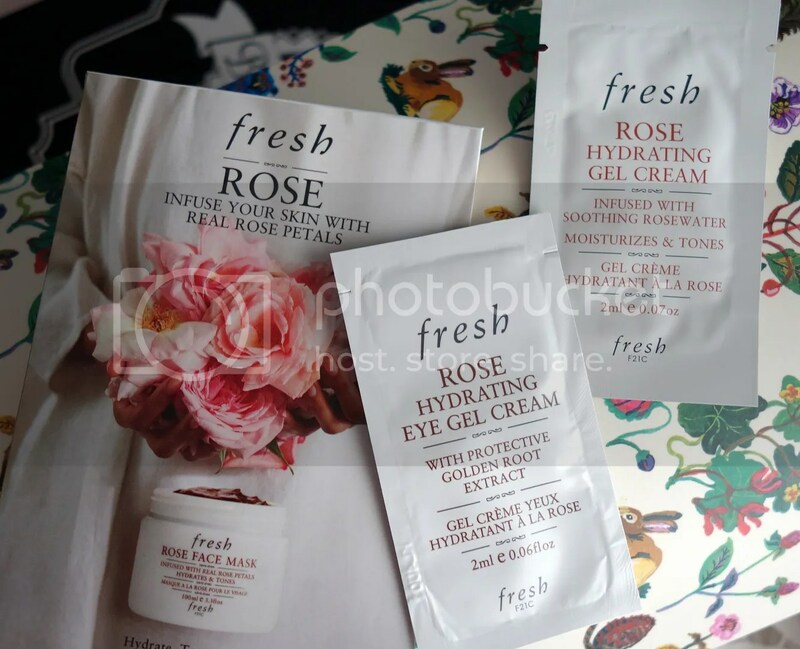 Heard so much about Fresh’s products and i’m glad that a travel size Fresh Rose Face Mask is inside the July’s box. 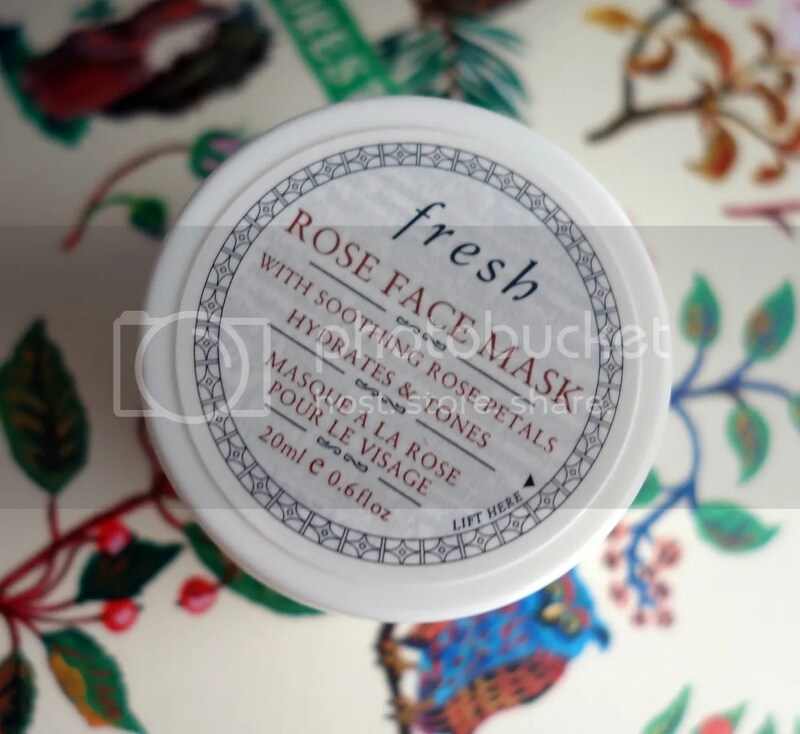 Rose Face Mask hydrates and tones the complexion to restore radiance and suppleness to all skin types. The unique, cooling gel formula is infused with real rose petals that literally melt into the skin. Antioxidant-rich green tea (brighten and protect). Ever since i chanced upon the Skinfood Black Sugar Perfect serum in Korea, i have never looked back since it worked so well for my sensitive skin! During Shan’s recent trip to Korea, i have asked her to get more products from Skinfood (So addictive. LOL!) 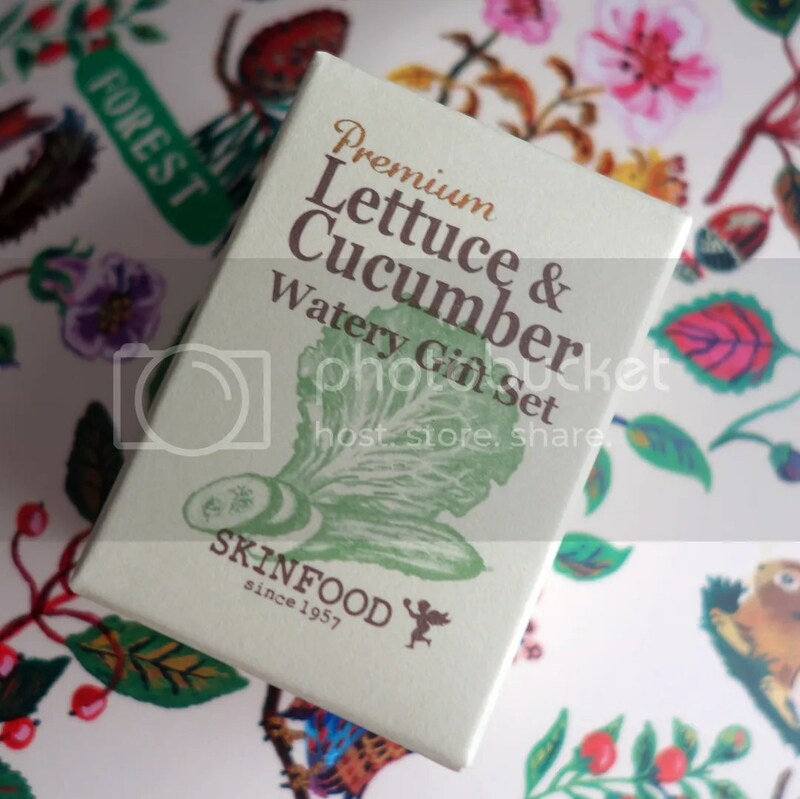 Inside the July’s trove, there’s the Skinfood Lettuce & Cucumber Watery Gift Set so there’s more products from Skinfood which i can try again. 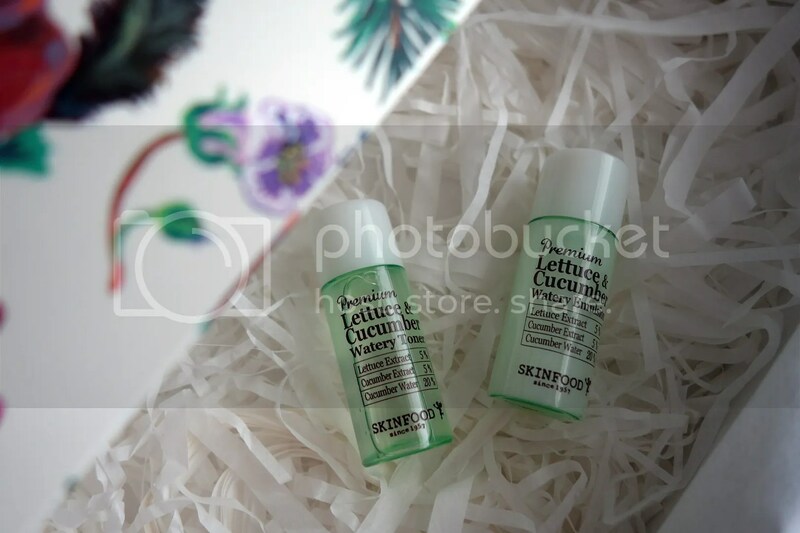 The Premium Lettuce and Cucumber series is a hydrating and Intense Moisturizer Line which uses nano technology, this intensive hydrating range provides moisture to skin instantly, leaving it moist and clean. It contains water-rich lettuce and cucumber extracts with 99% water. 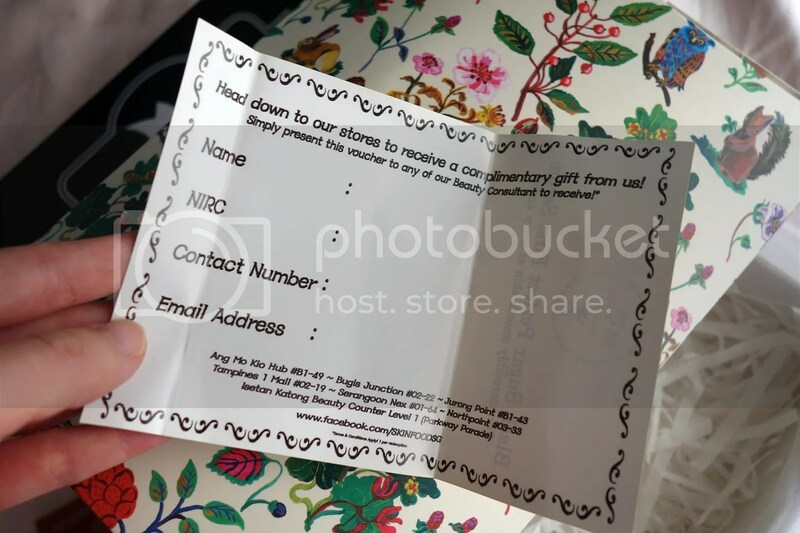 Keeping this 2 items for my Trip to KL & Bangkok in December! hehe~ Will need more hydrating products as my skin will turn very tight after travelling on the plane. I’m keeping the following 2 products for my upcoming KL/BKK trip as i need travel size toiletries as i will be bringing only a hand-carry. 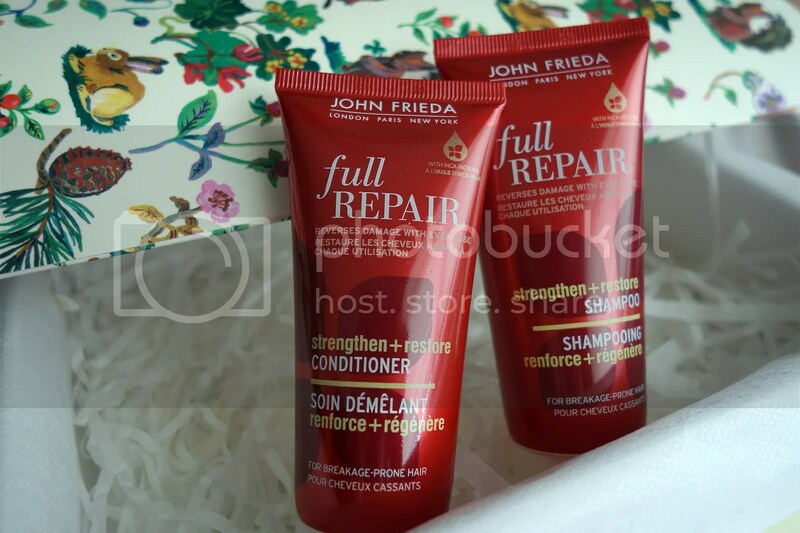 John Frieda Full Repair Strengthen+Restore Shampoo and John Frieda Full Repair Strengthen+Restore Conditioner are made for damaged colored / chemical treated hair in mind. It will reverse damage with every use as it is formulated with Strengthening formula – Inca Inchi Oil and Omega-3. It works by reversing the look and feel of damaged hair as it restores strength for full, bouncy styles without weighing the hair down. It also protects brittle strands, reducing the risk of breakage and split end. 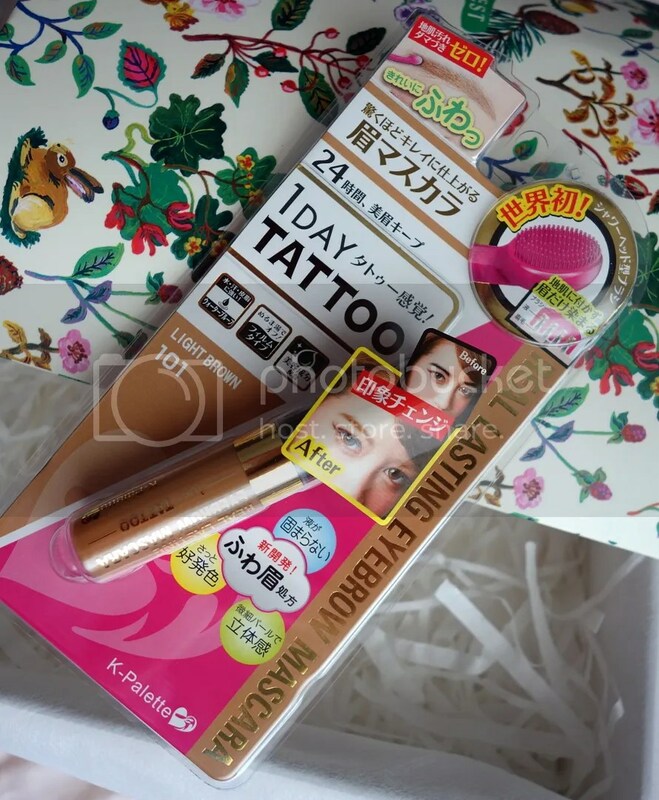 Last but not least, there’s another full size product in July’s Trove – K-Palette 1 Day Tattoo Eyebrow Mascara ($19.90). If you are facing first world problems like having mismatch brow colors due to your hair color or unable to use an eyebrow color effectively; then you are in for a treat. K-Palette Real Lasting Eyebrow Mascara, with its unique brush shape and formulation ensures that you get the most lasting and beautiful eyebrow colors, all while caring for your skin and lash with its inclusion of beauty essences to care for your brows! The eyebrow mascara comes with an innovative shower head-shaped brush that does not touch the base of the skin when the mascara is being applied onto the eyebrow. 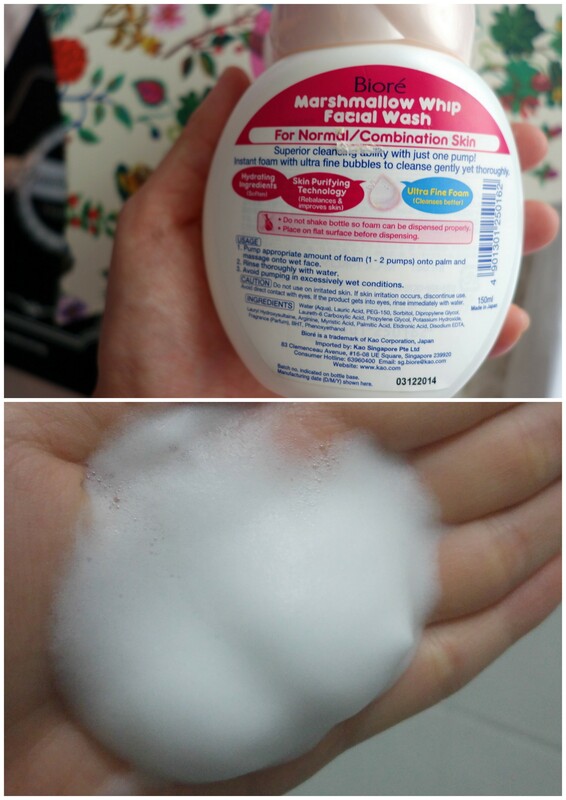 Moreover, it prevents small powder particles clumping together. As the liquid coats the eyebrows easily, great coloring can be achieved in a single stroke. Due to the balanced combination of the ingredients, an amazing softness can be achieved. The liquid does not solidify hence, providing the user with a natural and 3d finishing. I have just dyed my hair recently to light brown with pink highlights so the color of my brows are black (such a big contrast and i don’t like it). The K-Palette 1 Day Tattoo Eyebrow Mascara (in light brown) is a close match so i don’t have to sport such strong black brows! As i tend to exert too much force while applying makeup, using eye brown pencil can be such a pain so i will tend to use too much product on my brows. However, this K-Palette Eyebrow Mascara is really easy to use to achieve the color i want due to its shower head-shaped brush! It enables me to control and color each and every strand of my eyebrows so effortlessly + naturally. There is also no need to use your eyebrow brush to even the color which saves me time and effort. K-Palette is highly raved for its eye-makeup products – esp the long-lasting and award-winning range of ‘One Day Tattoo’ eye cosmetics. 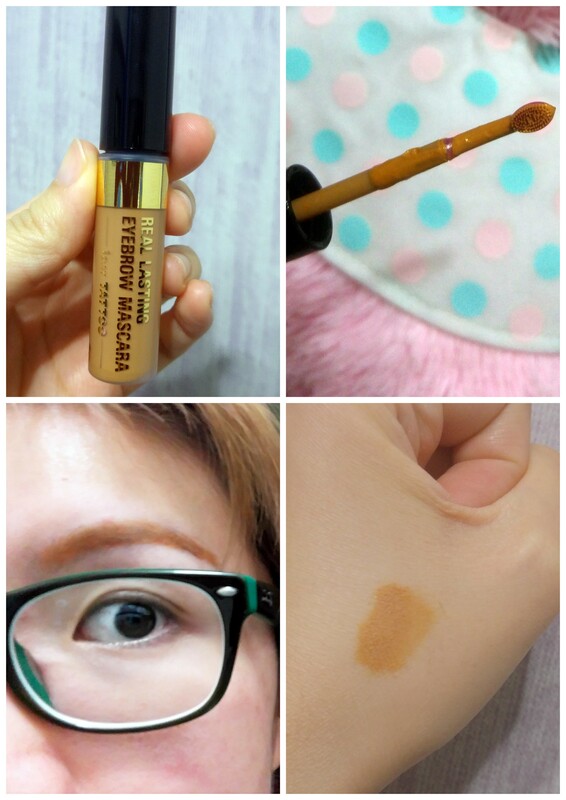 Hence the 1 Day Tattoo Eyebrow Mascara is also very long-lasting and waterproof, so you need not worry about color disappearing due to sweat or sebum! 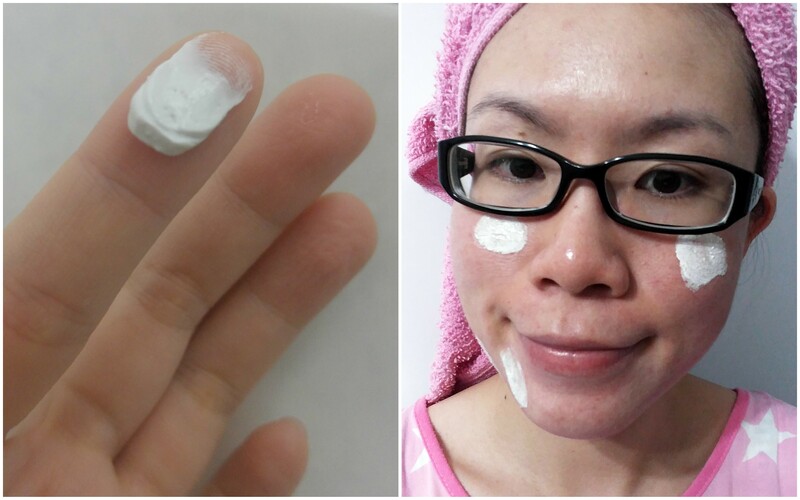 But due to the long-lastingness, you will need an oil-based makeup remover to remove it completely. Since it is a combined month Trove, the items found are really worth it (in terms of value and also brands!) Like the July’s Trove, it consists of travel, deluxe and full Size items. 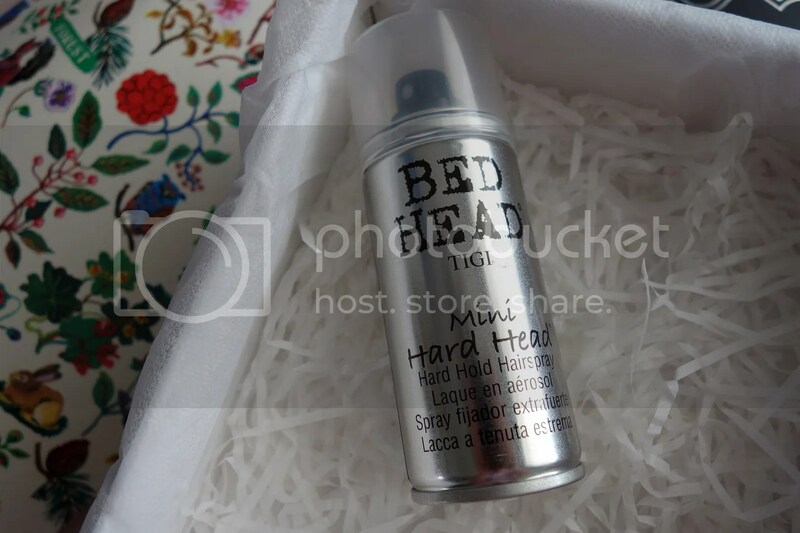 The first item that i dug out from the Aug / Sep Trove is the TIGI MINI Bed Head Hard Head Hair Spray as my husband is looking for a travel size hair spray which he can bring overseas. When he first saw the hair spray, he told me that it is from a good brand. haha. TIGI Bed Head Hard Head is a strong hold, buildable hairspray which is suitable for all hair types. This powerful finishing spray gives relentless hold and control that dries instantly and can be layered for extra hold; the more you use, the harder it gets! Hard Head also gives a subtle shine to your finished style, whilst lightly conditioning the hair. Ideal for any hair length, style or texture, Hard Head gently conditions and repairs the hair with a blend of Hydrolysed Wheat Protein whilst a blend of Polymers deliver a strong, flexible and relentless hold to ensure your style remains flawless all day long. Hard Head also smells good with a fruity Citrus Berry fragrance which entices the senses. 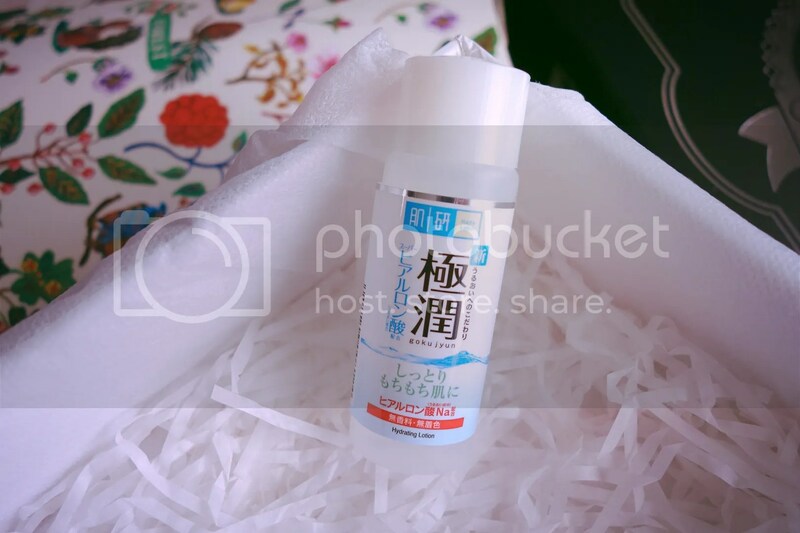 Next, this is an item which i’m sure almost everyone has heard / tried before – The Hada Labo SHA Lotion. With the philosophy of ‘Perfect X Simple’, Hada Labo uses only the purest ingredients of the highest concentration that are clinically proven with high efficacy. Manufactured under strict pharmaceutical standards, there are no unnecessary additives or ingredients in the brand’s products that burden the skin. BRTC (Bio Remedies Therapeutic Cosmetics) is an established medical beauty from Korea. AMI being its parent company, owns more than more than 1000 dermatological clinics and research laboratories in Korea. Therefore, having a strong leading position in Korea, the company is the first to introduced Blemish Balm into Korea’s market and further enhanced it into multi-functional Blemish Balm Cream thus leading it into a world’s craze.. 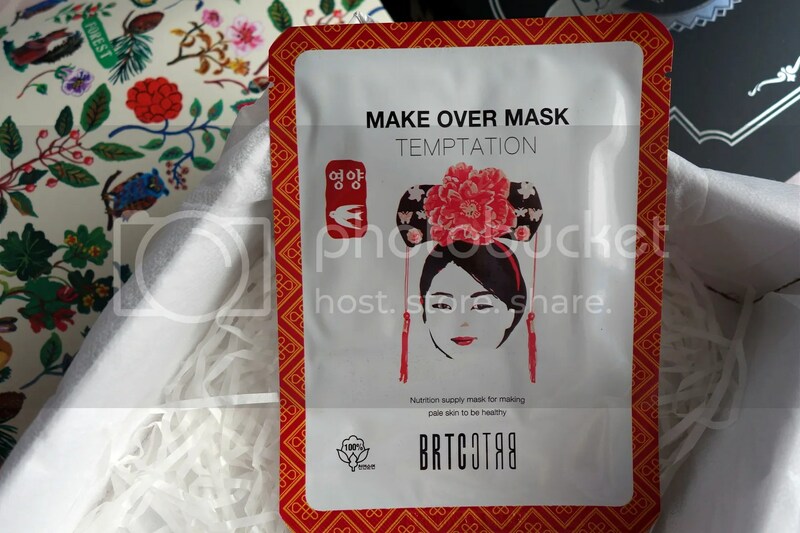 I have tried a few masks from BRTC before and i quite like it. 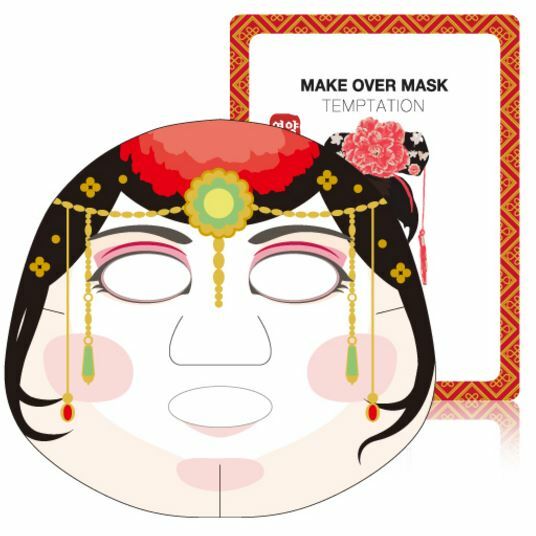 The BRTC Make Over Mask has the same concept as the animal mask just that it is in the design of the four great beauties. My husband finds it quite eerie looking (so there’s no picture! hahaha)! 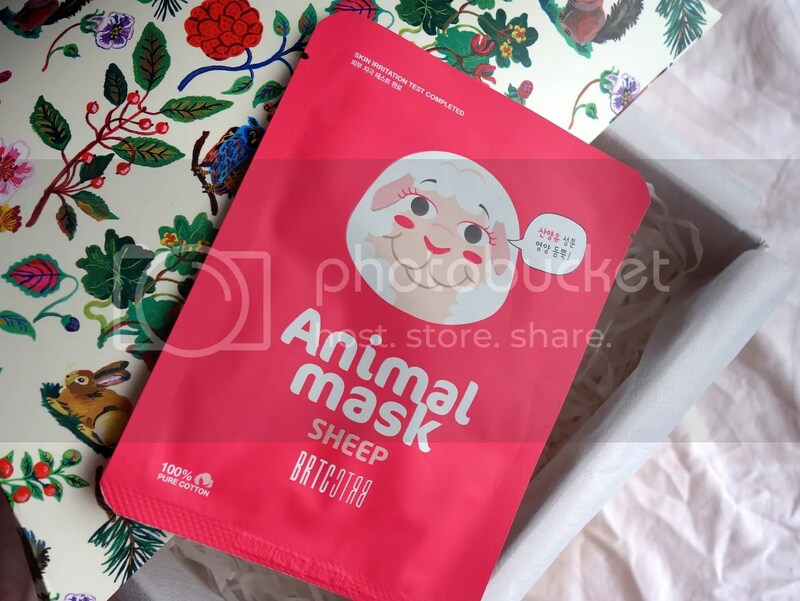 The material of the mask feels soft but it is sturdy enough for me to stretch it onto my skin without breaking (I hate mask that is too thin!).. Normally, i will face issue with 100% coverage of mask on my nose area (I have a non-existence nose to begin with) but this mask covers my entire face perfectly.. No trapped air bubbles are observed so it means the mask lies closely fitted to my skin.. After using the mask, my skin seems less red which means the mask calms my skin well.. Skin is less oily the next day (This shows that my skin is more hydrated which reduces the amount of sebum secretion). researched skincare products with proven efficacy. ASTALIFT is a scientific breakthrough in anti-ageing skincare that combines unique technological expertise in skin with advanced molecular research and patented innovation to become the specialists in collagen and antioxidants. 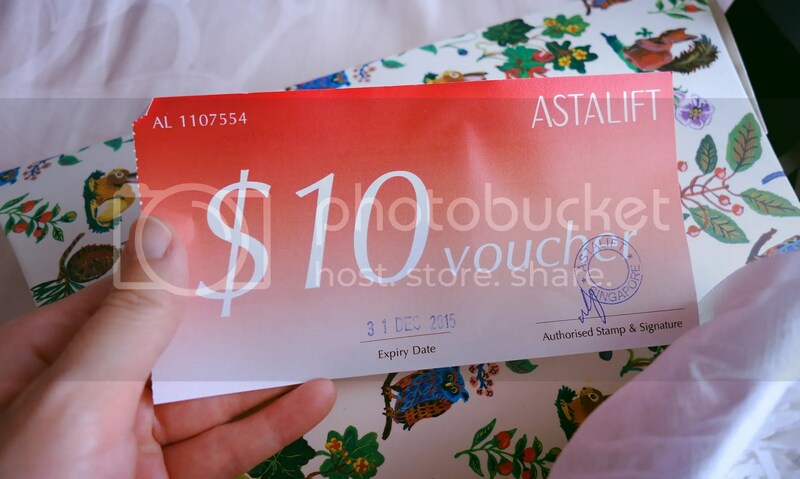 There’s also a $10 ASTALIFT Voucher included in the Trove so if you like the moisture foam, you can use it to offset your purchase. L’Oréal Extraordinary Oil soothes and restores dry and damaged hair so your hair can stay soft and tangle free with extra softness while i head out for work / leisure~ It contains 6 Precious Flower Oils (Lotus, Tiare, Rose, Flax, Chamomile & Marticaria). Upon application, the lightweight and non-greasy miracle oil gets absorbed and penetrates into the hair instantly. Luxuriously nourished and richly protected, the Extraordinary Oil reinvent hair to become sumptuously smooth and radiantly shiny. I’m using the one with brown cap one currently and will give this a try when it runs out. Let your lips speak volumes. Indulge in colour-intense lipstick with a highly pigmented formula, available in a choice of flawless finishes, from creamy matt to iridescent finishes. Illamasqua Lipstick glides on smoothly and doesn’t give up without a fight for the perfect all-night pout. 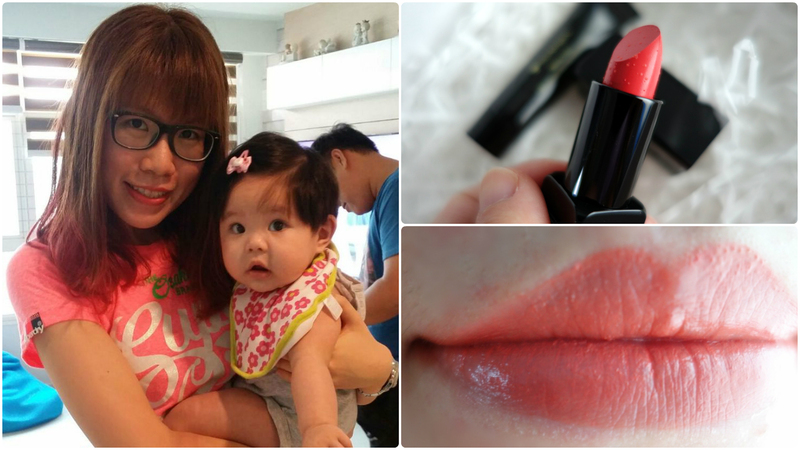 A must have for professional make-up artists, and those who want to make a statement. This formulation provides immediate intense pay off from the initial stroke and it can also be applied lightly as a lip stain that wears all day. First of all, the color is gorgeous – It has a vibrant warm pink shade. I feel that it looks sophisticated for work and it is also a very wearable color for all occasions. Especially i don’t wear makeup now, this lip color makes me look less haggard and brightens up my appearance.I would say that this lipstick has a matt finish so prep your lips with lip balm before application, if not it will emphasize your dry flaky lips. Texture wise, it is creamy and pigmented so a little goes a long way. 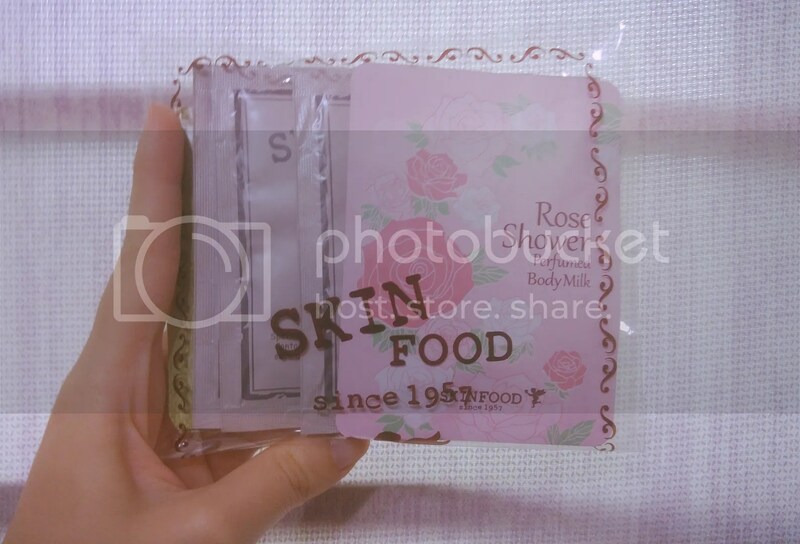 It is very long-lasting as the color is still obvious after eating and drinking. I even wiped my lips and some of the lipstick were still intact. However, i find that the formula is drying but this is not an issue to me as i can resolve it with a lip balm. There’s another set of shampoo and conditioner in Aug / Sep Trove and they are the Follizin Cleanser & Moisturiser. My first encounter with this brand and after a quick search, i found out that the brand is established in 2006. Follizin products come from the Research Laboratory that specializes in products to keep the scalp young and healthy for men and women of all ages. Research into the latest Skin Care Biotechnologies provides the background to this range of unique customized “Skin Care” products for the Scalp and Hair. It has been scientifically proven that healthy good-looking hair can only come from healthy scalps. Furthermore keeping our scalp skin young and firm will also help keep our face skin firmer slowing down the effects of aging on the face. 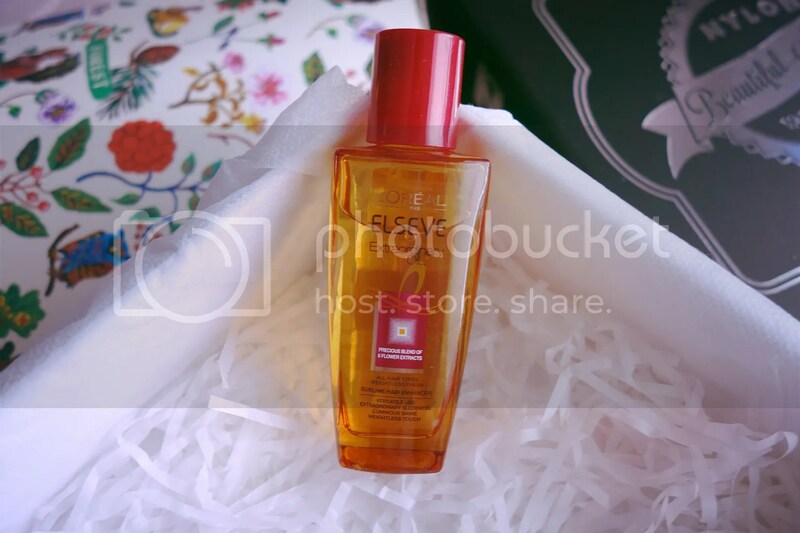 Cleanser – A gentle yet thorough cleanser for all scalp and hair types. SuGENE Technology provides a scalp safe environment, while Hygroscopic Action balances and maintains moisture on the scalp and hair. The Moisturizer (aka conditioner) – Delivers rich moisture and silky softness to dry, damaged and chemically treated hair. HYDRALOK Technology locks in moisture on the scalp and hair, improving overall manageability with no build-up and is color safe for hair. The Etude House Back to School Kit emphasizes on the importance of cleansing, exfoliating and hydrating to keep skin in excellent condition! It is important to use effective products that will remove all dust, excessive sebum, impurities and make-up which contributes to skin problems.. In addition, you will need a perfectly cleanse & exfoliated skin in order to prep it for your other skincare products. The Back to School Kit contains Real Art Cleansing Oil, Moistfull Collagen Peeling Wash, and Moistfull Collagen Sleeping Pack to help clean makeup and impurities off, exfoliating and then hydrating it with goodness! Real Art Cleansing Oil MOISTURE is a moist type cleansing oil containing moisture providing coconut oil and grape seed oil, apricot kernel oil effective for removing dead skin cells, cleansing away makeup residue and old skin cells. Moistfull Collagen Peeling Wash is a moisturizing peeling gel formulated with natural konjac makes skin feel moist and soft. It is formulated with Baobab Leaf Mucus, hydrolyzed Marine Collagen and Natural Jelly (Konjac) beads. This hydrating exfoliator gently refines without over drying the skin. Moistfull Collagen Sleeping Pack will makes skin feel hydrated and elastic by forming a moisturizing layer over the skin. Formulated with Baobab Leaf Mucus and hydrolyzed Marine Collagen, this overnight leave-in treatment creates a protective barrier on your skin, locking in vital moisture while you beauty sleep for a youthful, water bouncy skin. Aug / Sep’s Trove is full of brands from Korea. 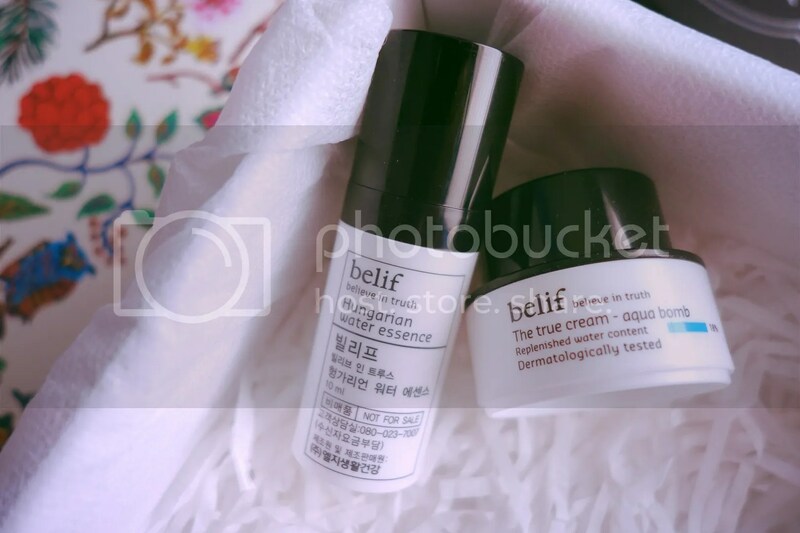 The last brand from Korea that Aug / Sep’s trove brings is Belif! Featuring the Belif Hungarian Water Essence & Belif The True Cream, your skin will stay hydrated! Moreover, both products will be handy if you are heading to a cold country for end of year vacation! Hungarian Water Essence– This essence (to be applied after using toner) contains hydration secrets of the legendary Hungarian Water that enabled Hungarian Queen Elizabeth to maintain her beauty into old age. This product is applied cool like a spritz of water, and clings to the skin lightly without stickiness, prolonging suppleness and softness. Another Deluxe Size shampoo and conditioner from John Frieda for me to keep for my future overseas trip! 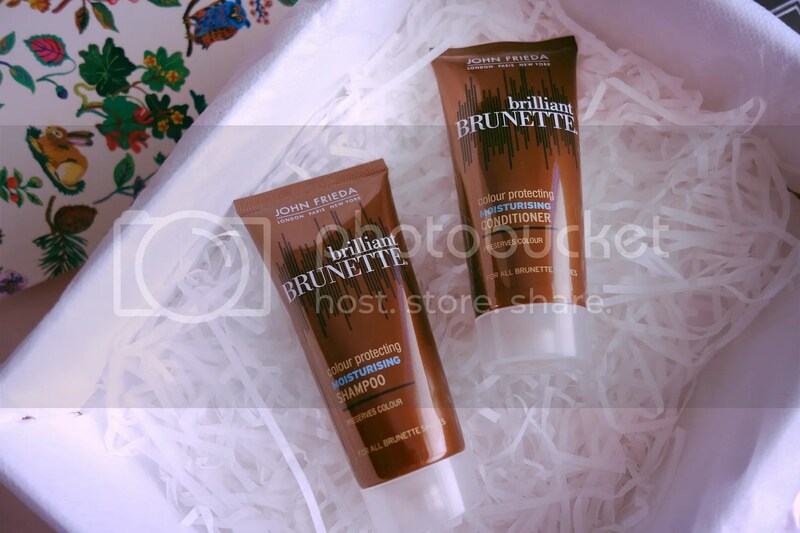 The Brilliant Brunette Colour Protecting Moisturising Shampoo & Conditioner preserves colour keeping it rich & vibrant while it moisturize it. With crushed pearls and sweet almond oil, moisturising formula protects and preserves colour as it rehydrates and replenishes dry, colour-treated hair for a satin feel. 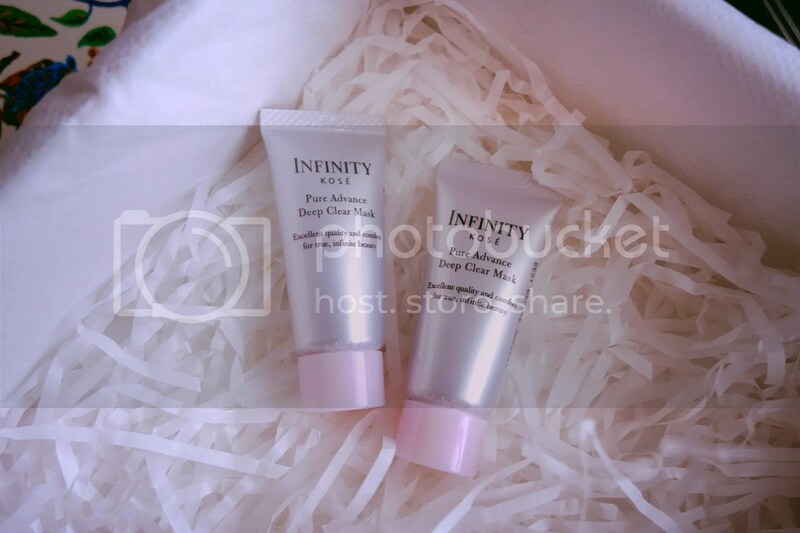 Next, i’m glad to see 2x Kosé Pure Advance Deep Clear Mask in the Trove as i am having hormonal breakouts (Need a clarifying mask to use on my acne and i ran out of it). Kosé Pure Advance Deep Clear Mask is a fast-acting mask that thoroughly scrubs away the aging-factors in pores.The clay-based mask and scrub combined have a dual effect on the skin, getting rid of blackheads and unwanted dead skin cells. The final item in Aug / Sep Trove is the Adidas Climacool Antiperspirant which i don’t use so i have passed it to my husband (who is happy with it as he can bring it to gym). The Adidas climacool anti-perspirant deodorant has a unique formula featuring advanced fresh capsule technology activated by movement so that the harder you go the better it works (Performance in Motion). The 48 Hour Protection ability will keep you smelling fresh while you move. 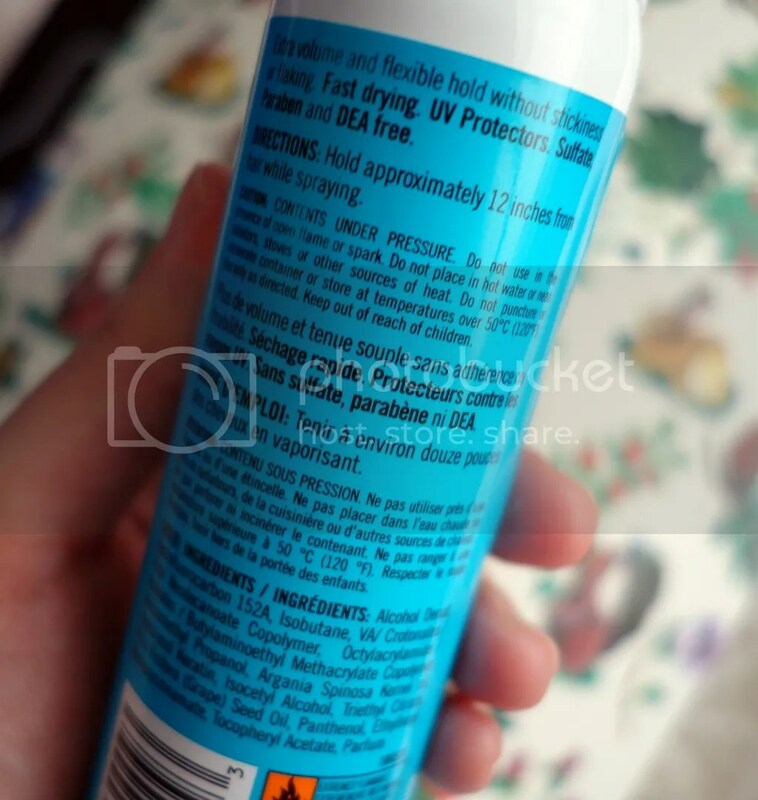 My husband said that the deodorant smells good and not too overpowering. He also observed that it is quite long-lasting as he still smells good at the end of the day (exact quote from him). Before i go, i’m glad that Vanity Trove is extending a 10% discount to my followers and readers. Just use this discount code ‘Jermaine10’ and you can enjoy 10% discount on your Trove purchase. Purchase it here! * Disclaimer: Products Description & information are extracted from Vanity Trove, Nylon Sg and respective brands’ websites.